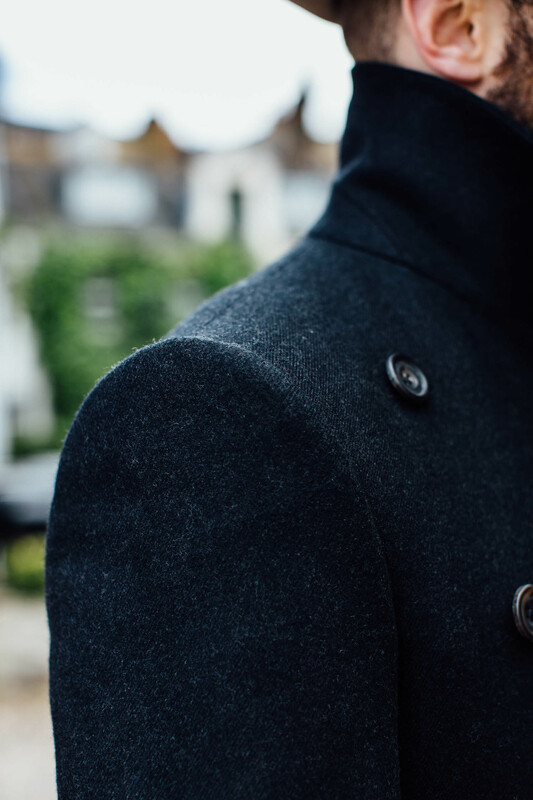 When selecting a cloth for an overcoat, what should you look for? This might seem like a pretty easy question: you want warmth. That’s what an overcoat is for. But how much warmth, and where it comes from, are not straightforward. As with anything we’ve covered in this Guide to Cloth (and the sister guide, on Shirt Fabric), when you start looking into this area you quickly learn that there are several factors at work, including fibre, weave and weight. Of these, weight is certainly the most important. And what weight to choose is always the first question readers ask. Some mills start their overcoating range at 370g or 13oz, which is very light. It’s the kind of weight I’d recommend for a jacket, rather than a coat. Most start closer to 500g or 18oz, which is more like it. Personally, I’d say someone buying a first good coat should be looking at 600-700g, or 20-25oz. That would cover most weather in most temperate countries. But there is also big variation around the world: in Hong Kong this weight would be too heavy; on the US East Coast it would be too light, at least for the real winter. A good tip is to ask a friend – one who’s had a coat made bespoke or made-to-measure – what he thinks is a good weight for where you both live. Otherwise 20-25oz is a good rule of thumb. My Cifonelli cashmere is 22oz, and I’ve found it good for most British winters. My Sexton (above) is 21oz, but rather warmer given its length, and it’s coped with New York winters. My top coats from Vergallo and Ettore de Cesare (below) are deliberately lighter: 17oz and 14oz respectively. Top coats moves us onto the next question: what weight should different coats in your wardrobe be? If that first coat was 20-25oz, a second could be lighter to cover more of the year in a temperate country, or heavier if you live in Toronto. A top coat would also usually be shorter, finishing just above the knee where an overcoat would be below it – which will also reduce its warmth. Any temperatures between an overcoat and that topcoat can be accommodated with accessories: scarves, hats, knitwear. That might seem obvious, but a lot of readers ask about these in-between days. And once you start thinking hard about weather-appropriate clothing, it’s frustrating when you feel you’re either under- or over-dressed. The next consideration is fibre. Cashmere will always be warmer for its weight, given its hollow fibres. And of course it feels wonderfully soft. The only downside is longevity. Cashmere is slightly more delicate than wool, and is more likely to show wear over time. However, if you’re reading an article like this on coat cloth, you’re probably also the kind of person that will look after an overcoat well. You’ll hang it up when you’re not using it; you won’t won’t wear a strap over the shoulder every day; you’ll brush it occasionally and rarely use dry cleaning. There are other good arguments for cashmere (or other precious fibres). One is that if you’re having something made beautifully by a bespoke tailor, you should pick the cloth that work the deserves. Another is that if you’re investing in such a coat, you probably already have another in your wardrobe already. So the cashmere won’t be worn day in, day out. If this coat is to be your workhorse, worn every winter for years, then good wool might still be the best option. But don’t be afraid of paying more for cashmere. There are also different qualities of cashmere. A high-street cashmere coat tends to be lighter, woven a little more loosely, and sometimes over-finished to make it feel softer. All these things mean it won’t last as long. The mills that supply most bespoke tailors are a lot safer. But still it’s worth considering not just the weight of the cashmere, but how solid and densely woven it feels. It’s a broad generalisation, but Italian mills tend to make such cloths a little lighter and looser, and are particularly worth checking in this respect. As ever, asking the tailor about their experience is always worthwhile. They’re likely to have seen coats in a variety of cloths made up, worn, and come back for repair. Among other fibre options, the guidance on cashmere also applies to vicuna, only more so: it’s warmer and softer, but also more delicate. Camel hair, on the other hand, can be nice because it feels similar to cashmere but is harder wearing. However it tends to only come in a few colours – usually natural and navy. Wool/cashmere blends can seem like the best of both worlds. But the small amount of cashmere will make little difference to warmth, so generally it’s only worth buying on softness. If the cloth feels a lot nicer to you than regular wool, that’s fine. If it doesn’t, ignore it. Other options include varieties of wool – often picked and then woven to be tougher or more water-resistant. Covert cloth, for example, is a wool woven in a steep twill, to make it denser. It’s more robust than most other overcoatings, but usually not as warm (not being cashmere, and often being a lighter weight more suited to top coats). Tweed is not a classic material for an overcoat because it is rather spongey, and therefore doesn’t have a clean, sharp line. But it is tough, and it’s hairiness makes it quite water-resistant. 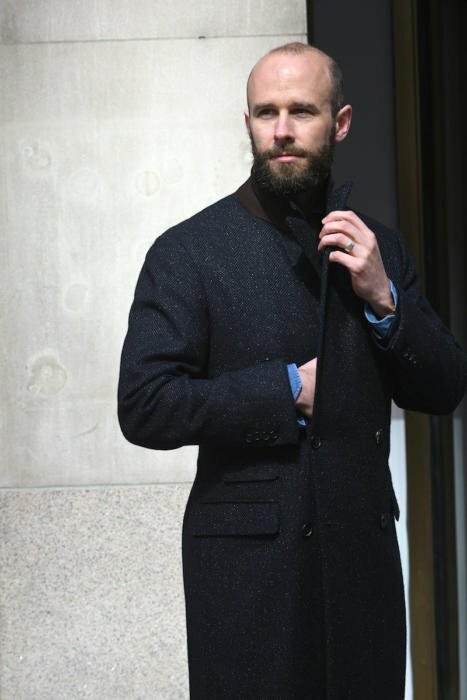 My Liverano overcoat (above) is made in such a tweed, and I’ve found it very practical. Water resistance should rarely be a prime driver for selecting a cloth, however. Anything that really makes a coat close to being waterproof will sacrifice other things, whether it’s softness, drape or look. In the end, if you want a quality coat, you also need to look after it. And that means carrying an umbrella, wearing a hat, or anything else to stop it getting drenched. And any of these suggested cloths can cope with a bit of rain. 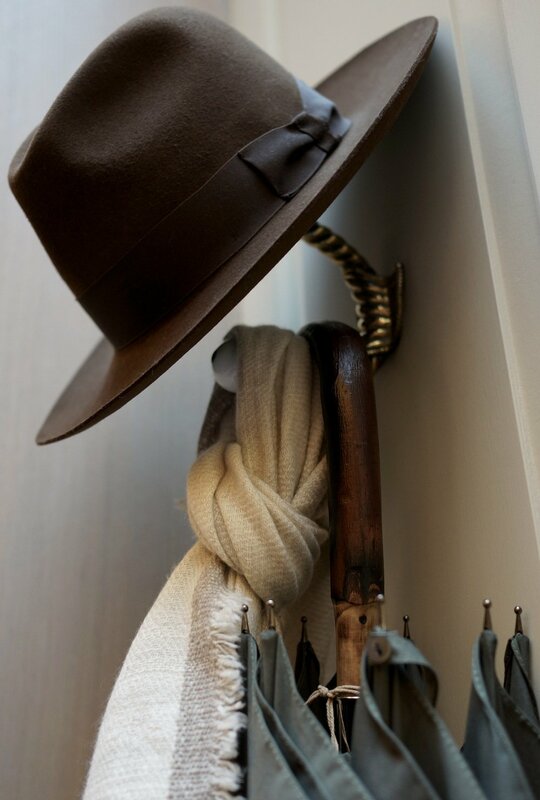 Just hang it when you get home and let it dry naturally. As for colour or pattern, the guidance is pretty simple: versatility is everything. 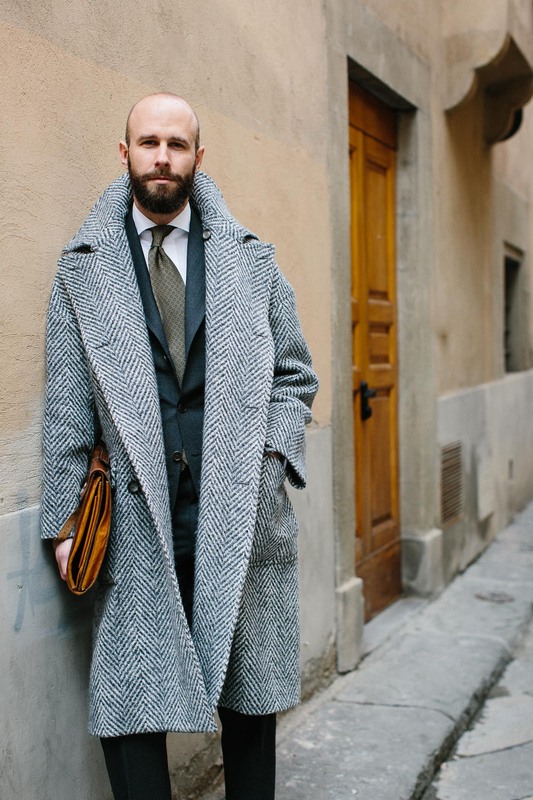 An overcoat needs to be able to go with more clothing than anything else you own. Particularly as you’re unlikely to have as many of them as suits, shirts or shoes. So for anyone that dresses remotely smartly, navy is the starting point. A plain navy double-breasted cashmere coat is perfect. 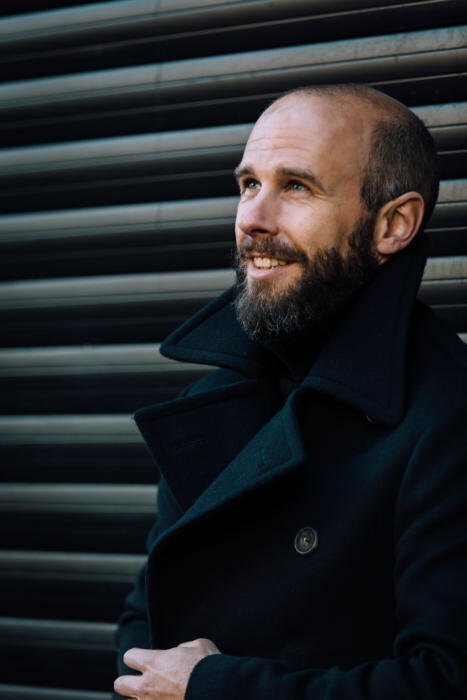 Charcoal is also a great colour for smart clothing (like my Sexton), but it never goes as well with tailoring in the same colour as navy. The only advantage of charcoal is that it arguably goes better with black tie. But that only applies to those that go to several black-tie events a year. Somehow that colour and pattern looks smart enough for a suit but casual enough for cotton trousers. Particularly in a soft, relaxed cut. 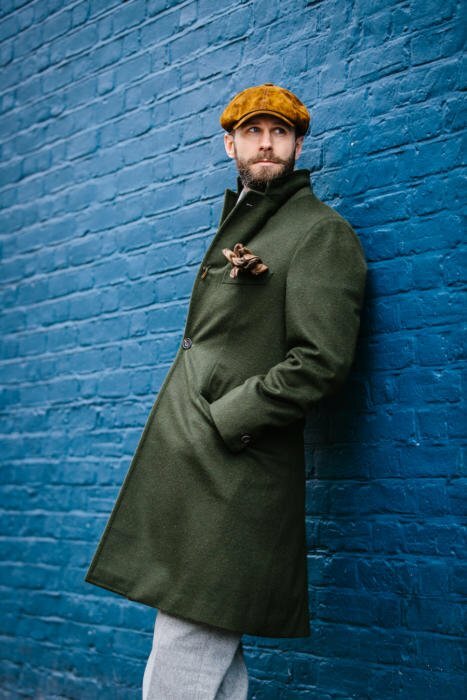 If you only wear sports coats and trousers, or even more casual clothing, then look at green and brown coats – like my green-loden Vergallo (below) for example, or brown-tweed Liverano. 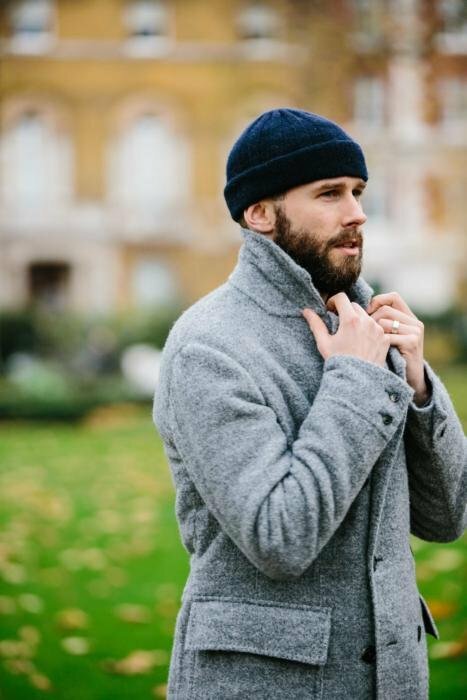 Anyone building a good range of coats could do worse than starting with navy cashmere, adding grey-herringbone wool, and finally something in brown or green. Those three should be everything they’d ever need. You can follow the discussion on The guide to overcoating cloths by entering your email address in the box below. You will then receive an email every time a new comment is added. These will also contain a link to a page where you can stop the alerts, and remove all of your related data from the site. Since you say waterproofing comes at a cost, any comment on the Loro Piana storm system coats? They boast of almost magical water resistant properties, with no loss of quality. Can it be true? How are you converting g to Oz, Simon? I’ve always though Oz meant Oz/ yard^2, and that g meant g/ m^2. This would mean a fabric reported as 500g would ~ as 15Oz, and 370g ~ 11Oz. Actually most people don’t use yards. However, it does vary between measuring per linear metre (of the cloth) and square metre. Which can be frustrating. I’ve just taken what the mill quotes as ounces or grams, and converted that directly into the other when I need an equivalent. That is indeed especially confusing, especially if not able to be seen in person apart from small swatches. But why didn’t you discuss Loden as cloth although you own a Loden overcoat? I’d like to hear more about your claim that camelhair wears harder than cashmere. In my experience 100% camelhair coats get worn down around the cuffs, collar, and underarm in a few years. – aren’t all animal fibers hollow? – are tweed fabrics (always) carded? – do Escorial fabrics exist for coats? If so, could it be a good alternative to cashmere, being cheaper and possibly less fragile? -have you ever tried a silk lining? It is said to be fragile and warmer, just wondering to what extent this is true. I am considering a lining made of Cupro and silk, I know it exists although I am struggling to source it. – I don’t think so, no. – No, not always, but usually. – I haven’t seen any, no. Interesting idea though. Thank you. Is it by default or else how much does C charge for a silk lining? I bought a few metres of the plain/ navy. The weight is 470gr, I am having made up in a classic double breasted Crombie style. For those of us likely to buy a coat off the rack some guidance on how to identify fabric weight from the label would be useful. A bit astonished, that you were not including animal skins/furs in this list. I have had some great navy shearling coats. It is really perfect for dead cold winters here in NYC and the brushed side of it is soft and neat looking like cashmere. What is your opinion on that, Simon? That’s your next project Simon, an overcoat with a shearling lining. What weight would you recommend for a coat for the depths of a New York winter? 30 oz? 35? It’s hard to know given I’ve never lived through one… Anyone else have a view? I live in Montreal and have found that most overcoats are great until about -10 to -15 degrees celsius, depending on the wind chill and humidity level. Below that and although more casual, a down parka is difficult to beat in terms of warmth. The challenge lies in finding one that you can wear with tailoring. I live in the Niagara region of Canada which is just across the river from upstate New York, so hopefully a rough approximation of the weather in which you live. I have a 32 oz peacoat. Wearing a heavy sweater underneath, I find it is ok down to maybe -10 degrees Celsius (I’m assuming here I’m spending 30 minutes or more outside). Below that, I get uncomfortably cold. A complicating factor here is that it is a peacoat, so it isn’t very long. I have a heavy wool chesterfield my Dad bought in England in the 1980s (St. Michael’s is the brand, I think). I don’t know the weight, but I’d venture it is probably in the 28 to 32 oz weight given how it feels compared to the peacoat. That I’m ok to wear to -20 or -25 degrees Celsius with wind chill added on top of this, assuming I’ve layered a light weight merino sweater with a tweed jacket. Below that, or if I’m more lightly layered, I will usually go to a down parka–style becoming subservient to comfort. If I really needed to look stylish outdoors, I’d probably be fine with the chesterfield and deal with feeling a little cold, but I’d be wearing my down gloves or mitts, ear coverings, and a relatively heavy wool hat (not cap/toque) to manage the worst elements of the cold. When I get around to doing a bespoke coat for the real cold, I’m sure I’ll get a cashmere/vicuna/alpaca fabric, get it double breasted (two layers of insulation at the front! ), and ensure the ability to button close the front as well as the skirt and vent. I’d also look at inner elastic cuffs for the ends of the sleeves to keep the wind out. A good fit at the waist is also critical for warmth–you’ll feel the cold air blow up the coat and the warm air get pushed out of it as you move if you don’t have a good fit there. St Michaels used to be an in-house brand for the department store Marks & Spencer in England. I’ve been in NY for nearly 30 winters of my adult life and they are surprisingly mild, ever more so lately… In grams, anything 500g and above should be fine. You can get greater warmth with layering, and covering the hands, neck and head. I just picked up a 460g cashmere double breasted coat. Albeit I “run hot”, I have been perfectly comfortable on the coldest NYC days so far with a winter weight suit underneath. I agree. Layering and accessories are the key. I’m fine in a 3 piece suit in a 13-14 oz. cloth, hat with ear coverings, scarf, warm gloves, and an overcoat in a standard 20-25 oz. weight for temperatures down to -15 C. So long as you’re moving and not standing still, I don’t think it’s necessary to search out heavier cloths. The accessories make the biggest difference in being fully covered. An astrakhan is also worlds better and more appropriate for these temps than any type of fedora/trilby. 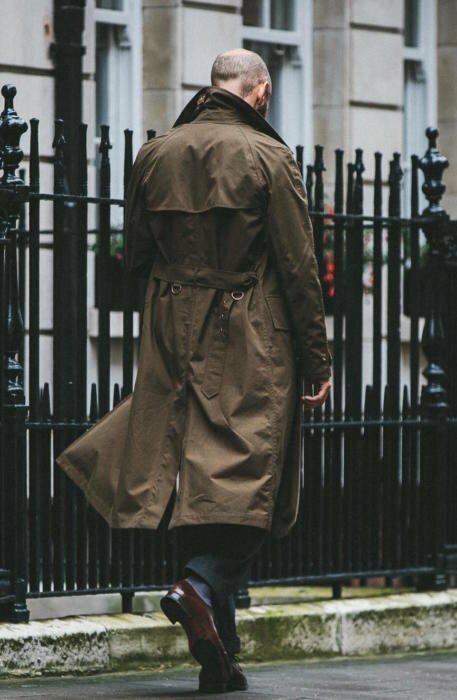 Excellent article excepting, in the real world , rain wear aside, most of us only want/need one overcoat. With that in mind, what would your definitive recommendation be and why ? Navy heavy wool. Maybe with a nice herringbone pattern in it. Navy will be the most versatile, unless you never dress smartly. Simon, looking for informational about the appropriate height/length/placement of the split on the lower rear of the coat. I’ve seen some starting 8 inches from the bottom (on a knee length garment), and I’ve seen some running from above the waistline. I’ve had an overcoat made in a 20oz navy wool with a thinsulate zip out inner shell through the body and sleeves. Without the shell is good for coolish weather. With the shell is perfect for freezing winters in NYC. By the way Simon you have overlooked a point of significant importance; weight is one thing, but DENSITY is the way to protect against wind. And then the inevitable question who is a good tailor for an overcoat? Any particular recommendable? Should I go to Savile Row or to Italy or perhaps somewhere else? And the price I should expect for a good overcoat? Around GBP 6.000,- for bespoke? And for RTW perhaps around GBP 3.000? It’s almost entirely about style – which style of coat have you seen that you like? Perhaps it would be interesting for people if you could go deep in explaining different styles of coats in depth in a separate post? And then hopefully a bit about coat tailors as well? Great article, timed just right for (Northern Hemisphere) winter. A pleasure also to see many of the PS coats in one article. Roughly, I think eight coats cover the bases, from light to heavy: rain mac, covert, camel or fawn wool, chesterfield, ‘king’ coat (double breasted town coat), tweed country coat, crombie, British warm or guards type, duffel. Of these I find the the mac, covert and crombie get the most wear. Understandably, if I were in the cold of NY something heavier would be useful. N.B. paras 15 and 24 read rather strangely i.e. ‘that work the deserves’? Really helpful post for whenever I get around to commissioning a bespoke coat. 1. You discuss cashmere and vicuna as warmer cloth. Camel you mention as soft and luxurious but don’t comment on its warmth. Would it be similar to wool or maybe a little less warm (I assume camels don’t want to overheat and just need some insulation over cold nights)? And on a similar vein, any comment on alpaca as an overcoating? 2. Do you have any thoughts on regional tailoring styles (Saville Row v. French v. Northern Italian v. Neapolitan)? Would it just be a matter of style (amount of structure and extent of finishing details), or would there be other differences of note? 1. Camel should be as warm if not warmer than wool. It gets very cold in the desert at night. And no, no experience with alpaca I’m afraid. Wow, what a beautiful collection of coats. Unfortunately I’m still at the beginning. I’ve heard of something like a rule that you should avoid notched lapels on DB coats. What do you think of this rule? I found a nice DB coat, but it holds me back. Simon, excellent article on a topic that has been on my mind. What manufacturers do you like for the wool/cashmere (20% approx) mix fabrics in the 20-25oz weight range ?I attended two of your events this year. Hopefully get to see you again in 2019. Merry Christmas and Happy New Year. Hi Simon…Am I correct in saying that the Private White PS Bridge Coat is around 22oz and their Pea Coat slightly heavier, at 30oz? I think you mentioned previously that warmth wise they would be comparative, due to the 20% Cashmere in the Bridge Coat? I wonder what was used for coats that were designed to stay outside for hours during “real” winters. I am thinking here about cold, continental winters (<-15C) and military (or similar) use. Were these coats somehow insulated (down / fur)? Top coat , overcoat …? Always tricky given they are mutually exclusive and the milder weather in temperate climates means they have limited use. I suppose what most people want is a happy medium between the two. maybe a bridge coat? Off Topic but did you see Harry Kane at SPOTY? I thought he looked great in very smart double breasted grey flannel suit, perhaps from A&S? More likely to be from M&S as they provide suits for the England team. Thank you for a very informative article Simon. I’m usually not layering much because otherwise I’m way too warm at the office so tend to have warm coats. I’ve got a 700gr huge glen check from Holland and Sherry, made as a polo coat by WW CHAN. It proved a great investment vs the cold Luxembourgish winter. However we rarely go below -15 Celsius. Simon, another great post. A related question – what colour overcoat would you wear over a tweed blazer? I have a tweed blazer very similar in look to your donegal suit made by Dalcuore, which I wear with navy chinos. I can’t quite fiend the right overcoat to wear over it though. Navy seems too formal and grey seems to jar with the tweed. Any help appreciated. Thanks. Hmm. Perhaps a dark green, eg loden? I would have thought a big grey herringbone would have worked as well? Speaking of coats, just received my Bridge Coat and it looks fantastic. Perfect length and lovely soft material. And that collar! Excellent article. Thank you. Did you post a separate article discussing the unconstructed grey coat at the top of the post? That style always catches my eye. Thanks Simon for a very informative an interesting artickle. I have bought several vintage Alpaca coats in excellent condition and was curious of what you think if Alpaca for cloth in a coat. I have looked forward to an article about various overcoat cloths for a while. There are some questions I have regarding overcoats. Firstly, fabrics such as guanaco and angora which I have a read about being fibres used to make overcoats; I have never found any comprehensive sources or images of what the texture of overcoats in these fabrics look like, and what their benefits are. 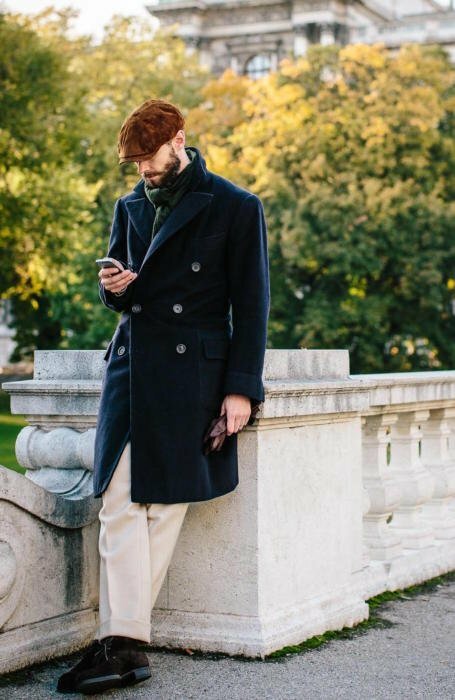 Secondly, apart from typical overcoat colours such as – Navy, grey, black, various shades of brown and green, camel, and the caramel colour of vicuna. What would be another classic or neutral overcoat colour worth considering? 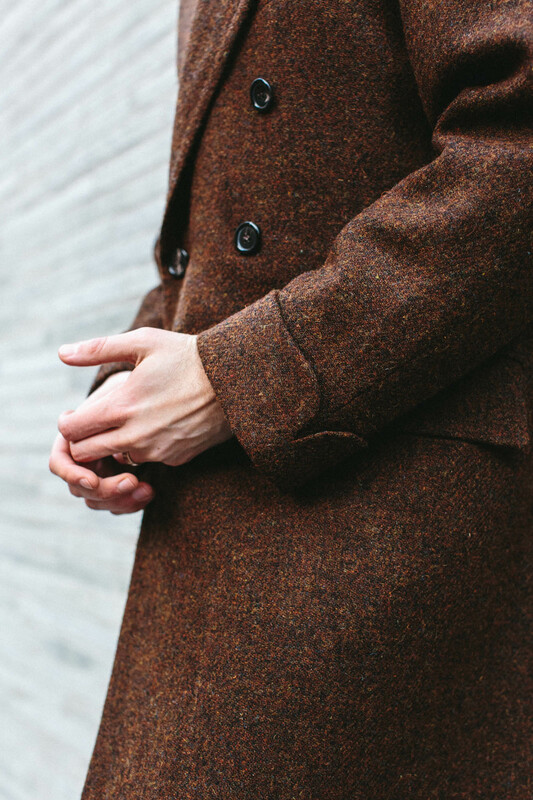 Lastly, what are your thoughts on overcoats in bold patterns like Plaids, tartans, and checks? Are such overcoats too fashionable and what would be the ideal fabric for such an overcoat. I have always entertained the idea of a patterned overcoat, for informal wear with casual garments, namely odd jackets and sweaters. That’s all of my questions. Thank you for taking the time to read my comment. I can’t help you with guanaco or angora I’m afraid. Personally I would look to different finishes on wool rather than these different fibres. That’s quite a lot of overcoat colours! I’d mostly look to shades within those, or weaves that create different textures – Loro Piana often has great greys and creams like that. And then there are tweeds of course. On patterns, personally I wouldn’t except for something like a herringbone. Even with a wardrobe like mine, I’d prefer to vary colours, weights, cuts and textures. Winter coats can be great fun to play with. I am able to visit many of the great mills in Yorkshire & Lancashire and often you can browse bunches in their mill shops and buy at VERY low cost then have it made up at a local tailor. For example, I saw an old photo taken on the Queen Mary in the ‘40s of a fantastic coat worn by non other than Stan Laurel Just the thing for cold Atlantic crossings! After some research I established it to be a Polo “wrap” coat, no buttons, Ulster Collar, Raglan Sleeve, Martingale belt and turnback cuffs. I bought a length of Camel hair from Dormeuil’s mill in Huddersfield and had it copied with a cupro lining by the very same tailor who made the Beatles stage suits when they first went to America. The Mrs stole it though. However, I have never found a tailor able to make a classic trench coat. Re. insulation, there are technical solutions such as ultra thin insulative membrane linings and also hydrophobic nano treatment such as P2i that are undetectable on fabrics. Why would the shorter topcoat be warmer than the longer overcoat? It sounds counter-intuitive. It’s worth pointing out that when you choose your cloth for an overcoat the higher up the weight scale you travel the more difficult it is for the coatmaker to execute certain parts of the garment and therefore what you gain in warmth and drape you may loose in detail. Think double breasted points in a 32oz British Warm – not a good idea. Very informative, particularly the importance of investing in a navy cashmere overcoat above all else. I’ve read Escorial makes a fine surrogate to cashmere in jacketings. Are they available as suitable overcoating cloths? Thanks for the reply and the heads up. 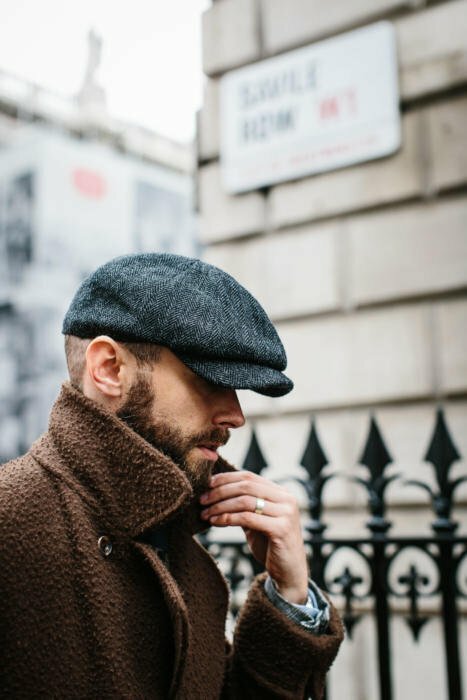 I’ll keep its availability in mind when seriously consider ordering a bespoke coat, weighing the pros and cons of different fabrics – cashmere, Escorial, cashmere-wool mix, camel, etc. Is that your new Chicago hat on the hook in the photograph, Simon? You really have an astonishing wardrobe and are looking ever cooler! Also incredible what you must know to answer the readers’ questions!